SmartCI has led the efforts to encourage innovations in the SmartCI research areas of interest through hosting innovative multidisciplinary research projects that target the development of Egypt’s critical infrastructure. SmartCI Research Center is planning to incubate up to 8 research teams in every cycle to write their research proposals through monthly research incentive of 1500 EGP for each team member. Furthermore, a maximum award of 10000 EGP may be offered to some teams upon proposal acceptance from the target funding agency according to their proposed project topic and team performance during proposal writing period. SmartCI Call for Concept Paper. Call for Concept Paper Brochure. Booklet of First Call Proposal Writings Abstracts. Concept paper submission through this form. Any submissions after the submission deadline will be excluded. Questions, comments or suggestions should be directed to: smartci_q@mena.vt.edu. 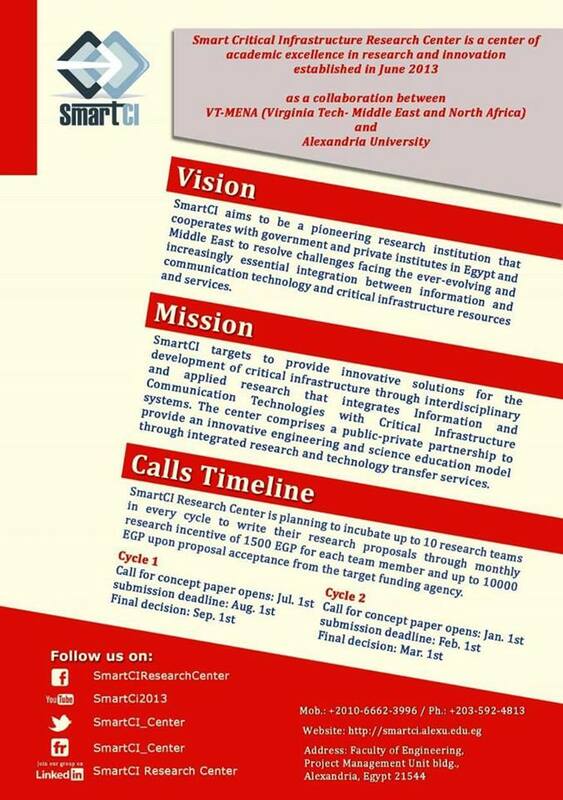 SmartCI Research Center is planning to incubate up to 10 research teams in every cycle to write their research proposals through monthly research incentive of 1500 EGP for each team member and up to 10000 EGP upon proposal acceptance from the target funding agency. Concept paper submission opens: January 1st, 2015 . Concept paper submission deadline: February 1st, 2015. Final decision announcement: March 1st, 2015. Revised concept paper submission deadline: March 8th, 2015. Contracts signing: March 15th to 31st, 2015. Hosting researchers starts on April 1st, 2015. This Project will help in fast and accurate diagnosis for medical images. It is targeting to limit and minimize user interaction needed to process segmentation. Reports are automatically generated metadata describing the images will be saved and accessed through web. After analysis of the 3D models, the generated reports can be saved to the patient medical records or integrated using medical standards like hl7. This project supports teleradiology, which is the transmission of medical images from one location to another, a technology that is needed and currently is very expensive. There is still a lot of room for improvement and solving its accuracy, image quality, lossless image compression, and transmission speed problems. Focus on clinical governance, medico-legal issues and quality assessment should also be considered. Radiologist desktop tools for speed diagnosis and reporting. ·Cloud based server side image processing for tablet and mobile. Cloud based Web access for reports and images using html5 interface. Archiving and retrieval system for old cases to help in statistical learning and educational purposes. Glaucoma is a characteristic optic neuropathy in which intraocular pressure (IOP) is a significant risk factor. Lowering of the IOP can be achieved medically or surgically. Surgical lowering of the IOP can be achieved by a number of surgical options, the most consistent and time-tested of which is the external fistulising operation, commonly known as Cairn’s trabeculectomy. Currently, the implementation of the trabeculectomy procedure is solely based on the surgeon skills and expertise, with no clear understanding of the engineering basics. The project aims to use numerical simulations to better understand the physics of trabeculectomy, along with some sensitivity analyses, in an effort to standardise its procedure. Being able to standardise the trabeculectomy procedure and understand its physical basics will be a milestone in the field of glaucoma surgeries, which will lead to more consistent, repeatable and successful surgeries. Specifically, the project targets to create a numerical model for the trabeculectomy operation, in an attempt to predict the flow of aqueous humour through the fistula created by the operation, and thus the expected reduction of IOP, at least in part.